It is reported that U.K based car maker Rolls-Roye has started making preparations for launching generation next Phantom in Indian car market sometimes during 2018. The proposed edition of Phantom will be the eight generation version which would be developed on completely new aluminium space frame architecture. Recently, the unit of same was captured best tested on roads under tight covers. Earlier before this, the car maker had released the teaser image of the same giving the glimpse of its aluminium structure. 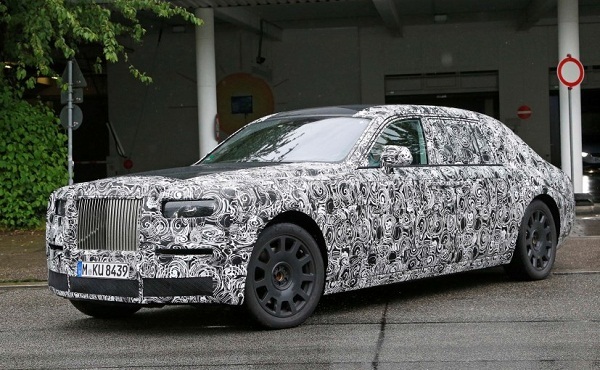 Apart from this change, the 2018 Rolls-Royce Phantom will also undergo various cosmetic changes. To begin with the powertrain, till date nothing has been disclosed by the British car maker, but it speculated to be offered with 6.6 litre twin turbocharged V12 petrol engine which will be followed by its plug-in hybrid version. The actual picture about the engine configuration will be revealed by the car maker when it will showcase the new avatar of Phantom during the Frankfurt Motor Show 2017. Moving towards the infrastructural changes, the generation next Phantom will be developed with enlarged dimension and longer wheelbase. The front grille will continue its existing look and will be placed between newly developed headlamps and new bumper. It is said that the exterior will be customized with new softer lines outsourced from Wraith and Dawn, but as the vehicle was completely camouflaged it was difficult to look over these lines. At the rear portion it was difficult to identify the changes except the newly developed taillamps. Inside the cabin, the Rolls-Royce Phantom will embellish contemporary features in form of dual-screen infotainment system, abundance of wooden work to enhance the looks of interiors.